Booker T. Washington Senior High School sophomore Victor Fleary could not take his eyes off the sleek Formula One racecar built by students in the College of Engineering and Computing at FIU. When he got a chance to slide into the cockpit and fiddle with the controls, he was even more impressed. That was precisely the message Alejandro Diaz, a mechanical engineering student at FIU and president of the Society of Automotive Engineers (SAE) chapter, said he hoped students would take away from the display, a part of FIU’s launch of the Engineers on Wheels initiative. Funded by a gift from the Chrysler Foundation and launched in conjunction with The Education Effect, FIU’s university community school partnership at Booker T., Engineers on Wheels will visit South Florida schools to provide students with hands-on activities and engineering experiments, as well as expose them to career opportunities in STEM (science, technology, engineering and math). The project will be led by students from the College of Engineering and overseen by FIU faculty. It builds upon the success of the college’s annual Engineering Expo, which brings more than 1,400 K-12 students from Miami-Dade and Broward county schools to FIU to learn firsthand about career opportunities in STEM. “Engineers on Wheels gives us the opportunity to take our lab experiments and instruments to the schools and impact a larger audience,’’ said Dean Amir Mirmiran of the College of Engineering and Computing. Beyond taking engineering dual enrollment courses at Booker T. and gaining hands-on experience through Engineers on Wheels, students can also benefit from FIU’s close relationship with the Chrysler Group, said Georgette Borrego Dulworth, director of talent acquisition and diversity at the company. FIU alumna Maria Quintero was recruited by Chrysler her senior year. She is now employed by Chrysler’s Institute of Engineering program while pursuing her master’s in engineering at the University of Michigan. 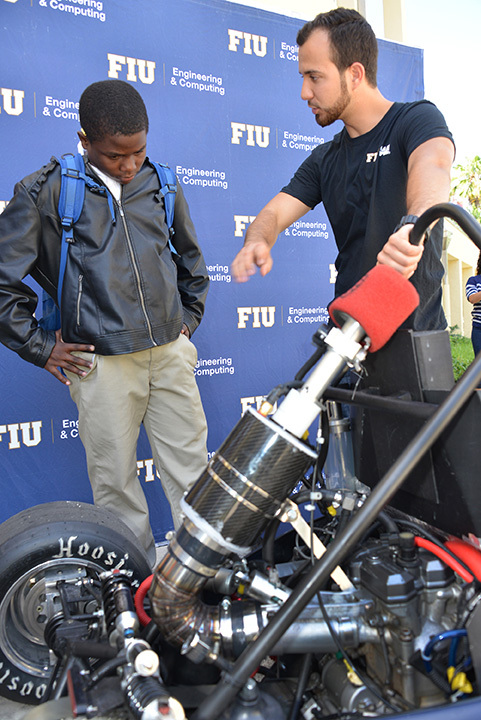 Irma Becerra-Fernandez, vice president for engagement at FIU, said together with The Education Effect, Engineers on Wheels will “show students the path” to a possible career in engineering. Learn more about Engineers on Wheels or contact Stephanie Strange for more information.